Here are some tips to finding a good mentor. Departmental research interest pages provide valuable information about ongoing faculty research. Students may be aided in identifying a potential faculty mentor by consultation with a Departmental DUS (Director of Undergraduate Studies), academic advisor, instructor, teaching assistant or friend who is performing or has performed research at Yale. Students should consider a number of factors (area of interest, adequacy of supervision plans to provide necessary training, expectations as to intensity and duration of the experience, etc.) in choosing a laboratory, and should discuss plans for the project, supervision and support with their intended faculty mentor. Talk to faculty in your science and engineering courses. They should be able to give you general guidance, and after you explain your interests, they may be able to steer you in promising directions with respect to specific departments or programs. Upper class and graduate students are also good sources for advice and leads. Arrange to meet with Dean Chang (s.chang@yale.edu) for additional advice. Search the web sites of relevant departments and research groups for faculty members who have research interests that overlap with yours. 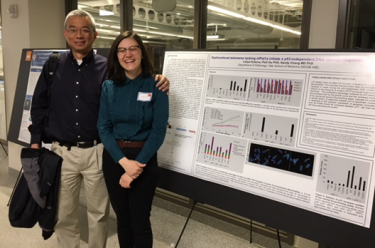 Dr. Sandy Chang and Lydia Kukova ‘17 in front of her poster. Lydia did a research project on telomere binding proteins for 3 years in Dr. Chang’s lab. In addition to the science and engineering departments that offer majors in Yale College, many Medical School departments (e.g., MBB, Cell Biology, Genetics, Immunobiology) have substantial basic biomedical research programs. A good source of information about research in the biological and biomedical sciences is the website for the Yale BBS graduate program. Also check out Yale Undergraduate Research Association (YURA) website which has a searchable listing of Yale science and engineering faculty mentors, along with additional suggestions on finding a research position. We have just compiled a list of faculty mentors who have taken Yale undergraduates into their lab in the past 4 years, you can find this list here. Remember, this is only a PARTIAL list. Virtually any of Yale’s 1,200 science and engineering laboratories could be the right lab for you! The bottom line is that want to be in a lab whose work excites you and makes you want to dive in. How do I approach faculty mentors? Any faculty member will become intrigued by a student who is excited about the lab’s science, has read 2-3 of the lab’s recent papers, and clearly wants to roll up his or her sleeves and get involved in research. So identify 3 labs that excite you, then do this reading before contacting the professors. In your initial contact, you want to be saying “I read about your discovery published in Nature and I think it’s just the sort of project I’d like to work on” rather than “I think I might be interested in genetics and wonder if I could work in your lab.” Similarly, when a faculty member meets with a student, it’s impressive when the student asks intelligent questions about where the lab’s work is heading now. It is VERY IMPORTANT when you discuss a summer research position with a potential faculty mentor to do it in person and in an organized manner. Email is the most effective means of making initial contact. In your email, attach a resume that highlights relevant coursework and prior research experience, if any. You should ask for an appointment to visit the person. This will allow you the opportunity to learn in detail what your summer project might entail. It also gives you a sense of the environment within which you will be working. Students usually find that the environment is as important as the science. You increase your chances of getting an appointment (i.e., getting your foot in the door) if you mention that you will be applying for fellowships, so that your research mentor does not need to be concerned with providing your support. Remember that while the mentor is evaluating you, you are also interviewing the mentor. Does the professor seem interested in you? Is she/he excited to meet you? Are there other undergrads in the lab? You might want to talk to them to get a feel about that particular lab. It is important to start this process early. I would start contacting potential mentors in the Fall of your first year. Remember, Yale professors are BUSY and you are not going to be their priority! I found a great mentor-how will my research project be defined? Ask your mentor if you can attend weekly lab meetings to get a feel of the projects that are going on in the lab. In some cases, your mentor will provide a listing of clearly defined research projects on which prospective students may work. In other cases, research projects may be defined through discussion between the faculty mentor and student, based on ongoing projects in the laboratory and the interests of the student. Students should not feel that they will be expected to approach a faculty member with clearly defined ideas of their own as to research projects; while original thought as to the initial design of a research project is welcomed, most students will look to their faculty mentors for guidance at this stage. Most likely, you will not have your “own” project, especially if you have not had any previous research experience. Rather, you will collaborate with a more advanced scientist (upper class student, grad student, post-doctoral fellow, or faculty member) and assist with a component of the ongoing research. You should focus on learning techniques in the first few weeks and read as many papers as possible on your research topic. While you may be expected to do a small amount of routine laboratory support work, such as lab maintenance, library research, etc., you should not take a position in which your major duties are glassware washing, making copies for the faculty member, or other such positions which do not fully expose you to the active research of the research group. More information on research conducted by the Biological Sciences faculty that presented at the January 2019 matchmaking session can be found here. More information on research conducted by the Physical Sciences, Chemistry, Computer Science and Engineering faculty that presented at the January 2019 matchmaking session can be found here.